Learn how to tie the palomar knot by using these easy to understand step by step procedures, along with instructional illustrated pictures to follow along with. The palomar is about one the absolute strongest, and one of the best fishing knots to use. 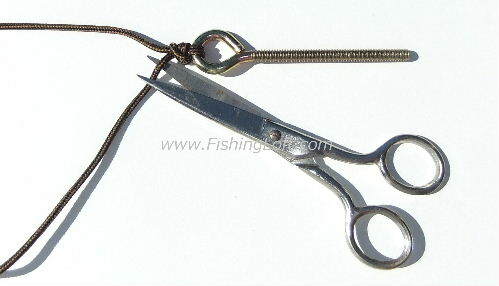 I use this fishing knot with most of my fishing rigs, especially when I'm running and gunning. It's simple and quick to tie, and has great strength for working heavy cover and battling those big fish. Within a few tries, you should be able to master this fishing knot with ease. 1. Begin by running the tag end of the fishing line through the eye hole. QUICK TIP: Feel free to skip this step if you are able to double the loop end and pass it through the eye, as shown in step 2 below. I, myself just find it easier most of the time to do it this way because the loop end isn't always easy to get through the eye hole. Besides, this allows for one less kink in the finished knot, providing it with better overall strength. 3. Allow for the loop end to be drawn out long enough for it to pass over the business end, then tie an overhand knot around the standing line. But, be sure not to cinch it down yet. 4. Pass the loop over the business end (this could be the swivel, hook and/or bait or lure). 5. Begin pulling the fishing line, moisten the knotted area with saliva, then finish pulling the line to cinch the knot tight. 6. Cut off the tag end of the fishing line and you should be good to go. Now you're ready for some freshwater fishing fun. As I've already mentioned above, this is a pretty durable knot. And it's one of my favorites. I'm confident that once you've learned how to tie this knot and try it out for yourself, I think that you'll agree that this is a great knot too. Will it be your go-to knot, or nah? If you're serious about fishing, it's a good idea to learn about which knots are best to use and for what. Books and videos are perfect just for that. It can also be just as helpful to carry a set of waterproof knot tying instructions with yourself out on the water.